No matter how shiny and sparkling a shower looks when it’s new, ongoing use can quickly transform that modern shower into a dirty space. The fact is, simply using your shower every day fills it with moisture, humidity and soap scum that tends to build up and worsen over time; so before you know it, you have a shower that no longer looks so great. Knowing this, what can you do? How can you keep your shower enclosure in mint condition? Whether you have shower curtains or a glass shower door, what steps can you take to prevent mold and mildew from accumulating? To help answer these questions, here’s a look at the ins and outs of keeping your shower clean. The first step in keeping a cleaner shower is to accept the fact that you’re going to have to work at it. By the very nature of the way they’re used, showers require thorough cleaning on a frequent basis. That’s because, through regular use, showers accumulate moisture that can lead to mildew or mold, creating not only unsightly areas but also actual health hazards for the people using them. Vinegar and dishwashing detergent. Secure a bag of vinegar around your showerhead overnight to instantly restore its shine. Mix vinegar with dishwashing detergent for a quick and effective cleaning liquid to use in the shower any time. Combine vinegar with water to have a powerful, acidic cleanser to combat soap scum. Baking soda. Combining good old baking soda with vinegar and salt creates a strong weapon against mineral deposits in the shower. Let the mixture set a few minutes before scrubbing with water. 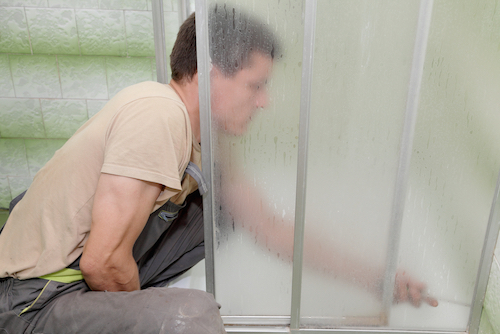 Squeegee: For glass shower doors, keep an inexpensive squeegee in the shower and use it to wipe the glass every day. Doing so will only take a few seconds, but it will make a huge difference in preventing soap scum from building. Toothbrush: An old toothbrush is a great tool for getting into the tiny nooks and crannies of a shower space. Get into the tracks of your sliding glass shower door, around the rim of the drain, or anywhere that’s usually hard to access and clean. The arch nemesis of any clean shower enclosure is mildew, particularly in shower creases or grout lines. One option to try is a toothbrush dipped in vinegar, used to scrub/remove the mildew. You can also try attacking this problem with a solution of 10 parts water to 1 part bleach. For more stubborn areas, soak the mildew in bleach overnight. In any case, take preventative measures to avoid touching or inhaling the bleach fumes, which can be toxic. Saltwater bath. Try soaking the curtain in a saltwater bath for several hours. Afterward, let it thoroughly dry and then rehang it. Uneven edges. Give the bottom of your curtain a little extra protection against mold by using pinking shears to cut its bottom edge. This makes the bottom uneven, helping water drip off and away from the curtain before mold forms. When you have a beautiful bathroom, you want to keep it clean! Use the tips above to get your shower sparkling — and when you want bathroom fixtures or products to update the bath in your home, come to Modern Bathroom! It doesn’t matter if it’s a tiny powder room or a luxury master bath, when you step into a bathroom for the first time, what’s one of the first things you notice? The vanity. Bathroom vanities tend to be focal points in bathrooms, housing the sinks and usually some counter and/or storage space. What’s more, as part of the overall look of a bathroom, vanities and vanity tops can provide an attractive design component, showcasing a desired style. 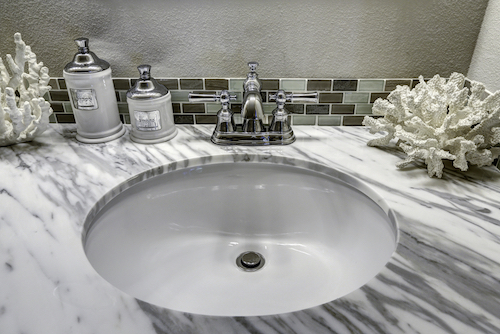 Stone: If it’s bathroom beauty you’re after, it’s hard to beat the look of granite or marble countertops. Available in various colors and patterns, stone countertops are trendy yet timeless. Using them is a sure sign of luxury — and a great pick for resale value. Just note these options are also on the more expensive end of bathroom vanities, ranging between $125 and $250 per linear foot. Tile: Durable and attractive, tile is a long-beloved bathroom choice. It comes in all kinds of designs, can be laid in various patterns, and is made to last. While the grout between tiles traditionally is a magnet for mildew over time, some of the new products on the market work against this issue. Prices for tile can vary from $10 to $40 per linear foot. Laminate: Low maintenance, durable and inexpensive, laminate countertops offer incredible value. You can find laminate in a wide range of patterns and colors, with textures from mottled to super glossy and smooth. Prices are usually anywhere from $24 to $50 per linear foot. Solid Surface: To enjoy the beauty of stone with less of the downsides, consider solid surface (i.e., quartzite) countertops. Created from an acrylic resin, this material is resistant to scratches, cuts and burns. It’s an option that’s low maintenance, durable and available in a wide range of colors. Wood: It’s as true for bathroom vanities as it is for living room floors: Wood is a timeless, natural, traditional choice. In bathrooms, it’s attractive and easy to install; however, wood counters are also vulnerable to water damage, so they have to be well sealed. Choosing the right vanities for your bathrooms is a matter of knowing your personal preferences and tastes. Explore options online to get a feel for the look you like best, and use the information above to guide your decision. At Modern Bathroom, we’re proud to offer a wide range of bath vanities, from modern to antique, with various sink styles and sizes available. Click here to view vanities and learn more! What was originally marketed as a glorified horse trough (adding legs turned it into a tub) eventually became regarded as a must-have luxury item for the wealthiest homes in America. The clawfoot bathtub, an oval, freestanding tub typically made of cast iron and featuring a rolled rim, has come a long way throughout its American history. Today, this attractive and durable bathroom feature is seeing a strong resurgence in popularity, with builders and renovators opting again for the classic clawfoot bathtub in their designs. What’s the story with freestanding bathtubs? Where did they come from and are they a good investment today? To help answer these questions, here’s a brief look at the history of the clawfoot tub. In the early 19th century, clawfoot bathtubs were a mark of social standing and luxury, placed in private baths in wealthy homes where servants could fill them with water and have enough space around the sides to help a person bathe. Their designs were intricate, with long, sloping backs and increasingly ornate feet to match the design trends of the time. By the time World War I started, the distinguishing feet on these tubs represented much more than decorating sensibilities. Made of metal — a hot commodity in wartime — the feet were often confiscated for the war effort, used to make weapons and war supplies. The American construction boom that followed each World War emphasized affordable housing, increasingly with indoor plumbing. In order to build more houses for more people, builders swapped the freestanding tub with a built-in tub design, one made with easy-to-clean materials that could come in various colors. The 1950s and 1960s saw various blue, pink and other bathtub choices. As more people lived in communities of matching homes with matching designs, clawfoot bathtubs became a distant memory. 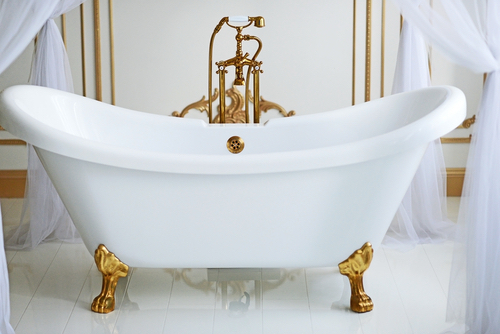 Today, as homeowners look for a way to distinguish their designs and add more luxury to their homes, the trend is return to the days of elegance that defined the early clawfoot tubs. Modern home designs are moving away from the cookie-cutter bathtub designs found in most homes, and choosing instead to opt for soaking tubs that stand on their own. While originally clawfoot tubs were made of heavy cast iron, today’s models are typically created with acrylic or fiberglass, providing all the elegance but less of the upkeep required with a traditional clawfoot bathtub. Are you interested in building a new home or remodeling a bathroom and wanting a soaking tub? Explore the available bathtubs at Modern Bathroom to learn more about today’s market and find the right products to suit you. Our products make it possible for customers to save up to 70 percent on bathroom features, in addition to free shipping and a low-price guarantee. Or if you’d like to get some advice on creating or renovating your perfect bath, get in touch with us today! If you’re thinking about a bathroom remodel — one that includes installing a new shower — you’re probably wondering if you can do it yourself, or if you ought to hire a contractor. Read on and we’ll detail the pros and cons of both options so that you can make the right decision. Save money on labor costs. Do the work on your own schedule, possibly minimizing disruption around the home. They have all the necessary tools, whereas you may need to invest in tools that you might not need after the renovation. DIY projects — because you’re working on them in the evenings after work or on the weekends — normally take far longer than projects completed by a contractor. Are you prepared for contingencies should problems arise? Contractors are equipped to deal with all the problems that could be hidden behind your shower — plumbing that you didn’t know was leaking, subflooring that needs to be replaced, and so on. Good contractors guarantee a professional look, whereas an inexperienced DIYer might make a few small mistakes that stand out, such as oddly cut tiles, fixtures that aren’t level, or finishing details like trim that aren’t quite right. Working with a contractor is easy. Once you’ve found someone who is within your budget and does excellent work, then it is time to sit with the contractor and hash out deadlines, materials and other details. If there are certain aspects of the job that you can do yourself — like the demolition, painting, tile work and other finishing projects — then let your contractor know in order to save money on the project. You can also opt to buy your own shower and shower hardware at a discount rather than having the contractor make the purchases from his or her suppliers. There are many great reasons to replace a bathroom shower. Obviously, it’s time to remodel if the shower is broken or so worn that it is stained or difficult to clean. In addition, remodeling is the only way that you’ll be able to keep up with interior design trends — an important factor in maintaining a home’s value. A contractor is one of your best assets when it comes to choosing design styles and themes. These professionals spend each day listening to the needs of their clients, which means that they know which styles are in high demand in your area. When it comes to a bathroom remodel, almost everyone can benefit from the services of a contractor. The fact is, unless you happen to be a contractor yourself, then it’s quite likely that you’re unaware of all of the issues that could occur. Again, unless you are a contractor, you may not have the tools, experience and knowledge to get the professional results that a contractor can provide. It sometimes seems like the easiest way to buy a new shower and all the fixtures that go along with it is to shop at your local home improvement centers. However, this comes with a couple of major disadvantages: First, you’ll be locked in to paying retail prices. The second disadvantage is that home improvement centers have a very limited selection. 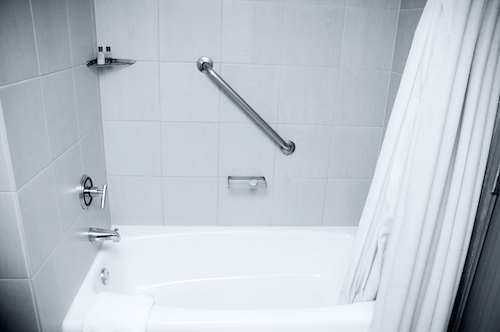 At any given time, you’ll only find a small sampling of showers, tubs, faucets and fixtures. The better option is to find an online retailer that can give you factory-direct savings and an immense selection. That is where we come in. At Modern Bathroom, you can save up to 70 percent on tubs, showers and other fixtures. Want to learn more? Call 1-888-777-1198 or contact us today.